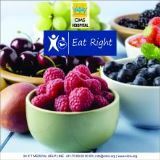 We believe in the old maxim-‘Health is Wealth‘. CIMS strongly believes in preventive health care and supports the belief that it is an investment which one cannot ignore. CIMS Health care Program is led by an expert medical team to take care of all concerns. Chewing tobacco/smoking or heavy drinker. Executive with a stressful job. Suffering from or having a family history of diabetes, high blood pressure and heart disease. Weight loss / weight gain. Swelling in stomach, hand-leg, breast, etc.